Roast leg of lamb makes an unforgettable main dish for your Easter celebration! Roast lamb is so delicious, moist, and tender when it is done right. 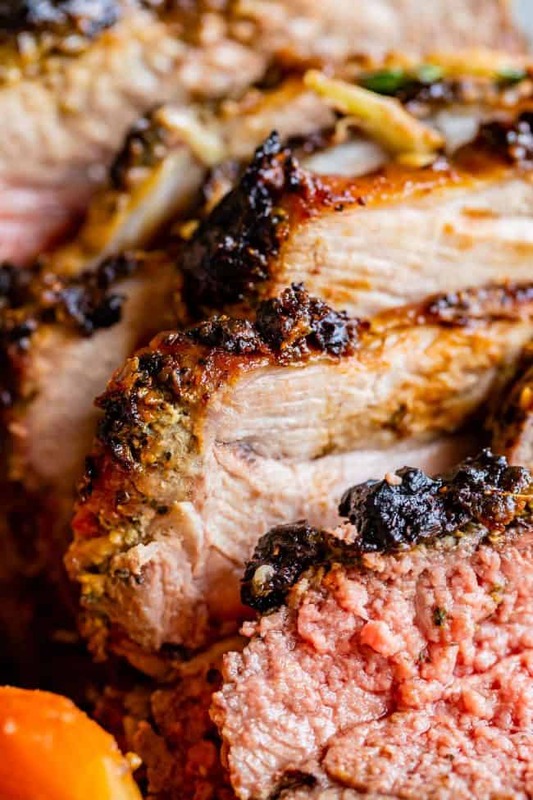 The secret is to crank up the oven to 500 degrees for a few minutes to get that blackened honey dijon crust, then lower the temperature to get the most tender, juicy roast lamb you've ever had. Get your lamb out of the fridge and let it sit on the counter while you make other preparations. Place your lamb on a work surface, the more rounded side up. If it is tied, leave the kitchen twine in place. Use a long thin knife to make 1 inch cuts all over the lamb, one for each slice of garlic. Slide your knife vertically into the lamb. Insert a slice of garlic into each cut. See photo (in the photo I had already rubbed the lamb with the Honey Dijon mixture. It doesn't matter which one you do first). Make the Honey Dijon Garlic Rub: to your food processor or blender that has 10 cloves of smashed garlic, add 1 tablespoon oregano, 1 tablespoon thyme, 1 teaspoon rosemary, 1 and 1/2 tablespoons kosher salt, 2 teaspoons black pepper, 1/4 cup Maille Honey Dijon Mustard, and 1 tablespoon olive oil. Blend or pulse until the garlic is well chopped and the mixture has come together. Scrape the sides and bottom if necessary. Pour the Honey Dijon mixture over the lamb and use your hands to rub it all over. Set aside. Prepare the other vegetables: thinly slice the red onions and add to the bottom of the roasting pan, where you should already have 4 smashed cloves of garlic. Peel a bunch of carrots and add to the bottom of the pan. Drizzle the vegetables with about 2 tablespoons of olive oil, and sprinkle with 2 teaspoons salt and 1/2 teaspoon pepper. Toss to coat. Place the leg of lamb on the rack, and place the rack on top of the vegetables. Meanwhile, place your oven rack on the second to lowest level so that the lamb will sit in the center of the oven. Preheat your oven to 500 degrees F. Give it a good 30 minutes to heat up, even if it says it's at temperature earlier. You want that oven screaming hot when you put the lamb in, that's what creates that crispy blackened exterior. If you have an oven-safe digital thermometer, insert it now into the center of the leg, making sure it is not touching the bone. Place the lamb in the oven, shutting the door as fast as you can to keep the heat in. Set a timer for 10 minutes. After 10 minutes, do NOT open the oven door, lower the oven temperature to 400 degrees F.
Continue cooking at 400 F for about 1 hour and 10-25 minutes. This will depend on how well done you want your lamb. See notes for a temperature guide. Trust your meat thermometer more than the clock. Once you take your lamb out of the oven, it will continue cooking and the temperature will rise about another 5 degrees, so consider that in your calculations. Keep in mind that overly cooked lamb is not very tasty. I prefer it in the medium range. See notes for a guide on internal temperatures. Once you have taken your lamb out of the oven, remove the rack to a cutting board. Cover the lamb loosely with tin foil. Let it rest for about 20 minutes. If you skip this step and slice it right away, all the juices will flow out and you will have sad dry lamb. Don't do it. Meanwhile, remove the carrots to a serving platter and keep warm. Leave the onions in the pan. Drain any excess fat from the roasting pan, leaving about 2 tablespoons. (If there is not enough fat, add a tablespoon or 2 of olive oil). Place your roasting pan over two burners on your stove and turn both on to medium. Add 1/4 cup flour to the onions and fat. Stir until coated and starting to sizzle. Add 2 tablespoons Maille Honey Dijon Mustard and stir to coat for about 1 minute. Add 1/2 cup white cooking wine and stir for 2-3 minutes until it has evaporated. Slowly stir in 3 cups of chicken broth, just a little bit at a time, stirring well as you go, and breaking up the flour from the onions. It will gradually thicken. If you add it too fast you might get chunky gravy, who wants that. Pour the gravy into a large gravy boat. Slice the lamb. (remove any kitchen twine with scissors) Use a long, thin, and very sharp knife. Begin by slicing on the edge parallel to the bone, until you reach the bone. Turn the leg so that the flat part (that you just sliced) is on your work surface. Cut perpendicular from the end of the lamb, slicing all the way through until you reach the bone. Once you reach the bone, continue slicing in the same direction down to the bone. Once you have sliced all the way across the top of the bone, slide your knife against the bone to cut underneath all the slices you just made. Serve with carrots and onion gravy. It would be amazing served with my Aunt Shirley's Famous Creamy Mashed Potatoes. *The photos show one red onion and one white onion. It's just what I had on hand! Either will work. I slightly prefer the flavor of red in this recipe but they are both good. Lamb internal temperature guide: remember that your lamb will continue cooking when you take it out of the oven. It will rise about 5 degrees.